Corporate members are critical to WEDA’s continued role as Wisconsin’s recognized voice on economic development. 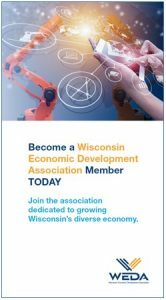 We invite you to join WEDA as a corporate member to distinguish your organization as a leader in economic development and help define and promote policies that drive business growth and economic activity in Wisconsin. As a corporate member, you will benefit from increased recognition, special membership and event discounts, as well as prominent placement at association events and featured listings in industry publications. Recognition with logo on signage at all WEDA events and conference materials. Exhibit space at the WEDA Governor’s Conference on Economic Development, and six complimentary registrations to the conference. Speaking opportunities at all WEDA hosted events. Recognition with logo on all signage at all WEDA events and conference materials.